Cabbage Roll Casserole – cabbage rolls can take time to make, why sacrifice that flavor? 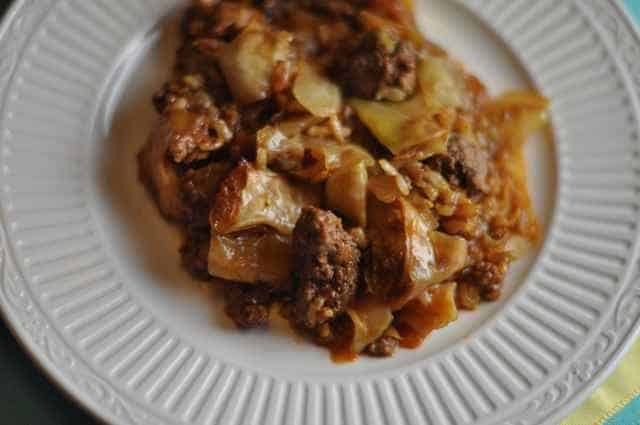 Home » Casserole Recipes » Cabbage Roll Casserole – cabbage rolls can take time to make, why sacrifice that flavor? If you love stuffed cabbage rolls, then you will love this. It is exactly the same taste in half of the time. One of my favorite dinners growing up was Cabbage Rolls. Often my Mom did not work when I was growing up and she had a lot of time to cook dinner, she would make these wonderful cabbage rolls. Tender cabbages stuffed with a seasoned hamburger and rice mixture, and these were covered with a slightly sweet tomato sauce. I work so its really hard for me to come home and prepare a dish like this, and eat the meal that evening. This casserole has all of the flavor of the cabbage rolls without all of the work. Love the flavor of cabbage rolls? You can enjoy that delicious flavor with cabbage roll casserole. Preheat oven to 350 degrees F. In a large skillet, brown beef in oil over medium high heat until redness is gone. Drain off fat. In a large mixing bowl combine the onion, tomato sauce, cabbage, rice and salt. Add the drained meat into the mixing bowl and mix all together. Pour mixture into a 9x13 baking dish. Pour broth over meat mixture and bake in the preheated oven, covered, for one hour. Stir, replace cover and bake for another 30 minutes. My favorite food from a child…now a senior. I make it like my mother and her friends did. Instead of the broth use Heinz tomato juice (do not substitue for another brand. And the meat make 65 percent beef and 35 percent pork.I wrap it in cabbage leaves when the leaves are big enough. Other wise I make it like you did almost. Try it? When I prepare it it can be all mixed together and cooked in the oven. Stephanie I never get disappointed anytime I visit your site. Thank you for amazing recipes! It’s such an easy recipe and has the delicious comfort-food feed of cabbage rolls. It’s officially my go-to cabbage recipe. thanks for sharing! This is a very tasty casserole that is easy to make. I love how inexpensive cabbage is. I am glad you enjoyed this recipe. I think it is a great way to get that similar flavor of cabbage rolls without so much work. Looks very easy to make for those of us who love cabbage rolls but hate the prep time! Can’t wait to try it out! Is the rice ‘instant’ or reg long grain? Thank you. This looks so yummy! I prepared this with regular long grain rice. No instant rice needed. I used regular long grain rice. I love this recipe and have made it twice now with my own revisions. I use V-8 juice with beef broth added and also use garlic, salt and pepper. We eat it with parmesan cheese sprinkled over the top. So delicious!! Thank you!! I bet it is fabulous with V-8 juice. I know when I make chili with that it is even better. Well I think that is a real compliment when it goes well at a dinner party. Love anything with cabbage and ground beef. This was great! I also tried the recipe substituting sweet Italian sausage (removed from casing) for the ground beef. Tried it a third time adding little red potatoes with the ground beef. All were tasty. I never thought about swapping out the sausage for the ground beef. That would be a great way to do it. I could also see how slipping in a few potatoes would be a great way to serve up this dish. I love your suggestions. Sounds delicious, I can not wait to try it. Hmmm, your comment makes me chuckle, your complaining about a recipe you have never tasted. OMG! I came here to look up the meat grinder post for the post I’m editing today and saw this! My post is about Asian Stuffed Cabbage Bundles! How funny is that? This casserole looks great! I’m going to have to try that next time. I will have to check out your Asian stuffed cabbage bundles, those sound amazing. This recipe is a fabulous idea. I can’t believe how easy!!! My family loves stuffed cabbage but it is so time consuming that I only make it for special occasions. Now I can make it any night of the week! I also think that it would make a wonderful and unusual covered dish, thanks a bunch! Yes, I love cabbage rolls too, but you have to steam cabbage, make the filling, then bake them, this is so much easier than the other way. Fixed for supper last night, my family and I loved it, So easy to make. Yes Tina. Look up the term ‘Copy & Paste’ and you’ll know what Mitch is describing. Oh heck, I might as well tell you here. To highlight text, press down the left mouse button and drag the cursor over the text you want to copy. Then press the right mouse button and click on Copy. Then open your favorite word program and right click again. Click on Paste and that’s it! Ready to save or print immediately. Good luck. There is a print screen button you may want to use, it looks like a printer. This produces the photo and recipe text only. I used to make a skillet casserole very similar to this by adding the cabbage and other ingredients to the browned beef. Tomato paste was used instead of tomato sauce. Very tasty and off the stove top. “Drain off fat In a large mixing bowl combine the onion, tomato sauce, cabbage, rice and salt. Add meat and mix all together. ” Does this mean that you are mixing the onion, tomato sauce etc in with the fat in the mixing bowl? I have made modification for clarity. There is not need to drain the meat fat into the mixing bowl. Please drain the meat fat, and do with it whatever you normally do. If the recipe is still not clear, please let me know. I love your recipie site,is there any way to save recipies on your site? I don’t currently have a way to save recipes. Hopefully one day! Save recipes..here is how I do it: Hilite recipe.. than, right click on it…select “copy” than open your word program and “paste” it to a blank document…name it and your done!! !